Purdue coach Matt Painter thought his team wasn't tough enough, mentally or physically, in its loss to No. 6 Michigan State on Tuesday. Purdue will get a chance to display the toughness Painter wants when it meets Wisconsin at the Kohl Center in Madison tonight. Like the Spartans, the Badgers' physical, aggressive style, especially on defense, means the Boilermakers will have to respond in kind to be successful. Painter made it clear after the game that “competitiveness” is not enough at Purdue. The Boilermakers have set a higher standard the last two seasons. Wisconsin (11-4, 3-1 Big Ten) is the latest in a string of difficult opponents for the Boilers (9-6, 2-2). The first four games on Purdue's Big Ten schedule were against ranked teams and while Wisconsin is outside the top 25, the Badgers received plenty of votes this week. Wisconsin needs a big home victory after losing at Western Kentucky and an ugly performance at the Kohl Center in which the Badgers shot just 23 percent from 3-point range while losing to Minnesota. They responded with a road win over Penn State, but another home loss would put a dent in their NCAA Tournament hopes. Meanwhile, the Boilermakers are trying to win their first road game. They are 0-4 in true road games, but three of those have come against ranked opponents. They are also trying to avoid dropping to 2-3 in Big Ten play for the first time since 2010. 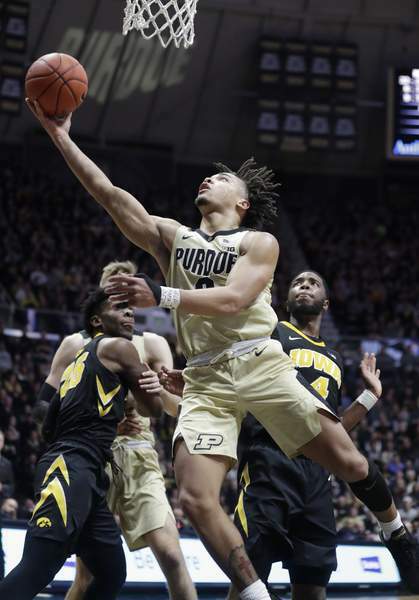 In addition to playing tougher than they did against Michigan State, the Boilers will also need guard Carsen Edwards to bounce back from his worst game of the season. Edwards, the Big Ten's leading scorer at 24.5 points per game, shot a dismal 3 of 16 from the field and took just four free throws. Painter said Edwards “guarded himself” to a certain extent and expressed a desire for the junior guard to try to get to the rim more often. For his part, Edwards didn't seem phased by the poor performance and repeatedly vowed to be better. Wisconsin coach Greg Gard is expecting Edwards' best. The Boilermakers will have to take on the Badgers while missing a player from their big man rotation. Forward Evan Boudreaux missed the second half of the Michigan State game with a groin injury and will not play against Wisconsin. That leaves sophomore Matt Haarms and freshman Trevion Williams to play larger roles. With Painter preferring to bring Haarms off the bench, Williams could get his first career start. The freshman had a breakout game against the Spartans, posting his first career double-double with 13 points and 12 rebounds. Against Wisconsin, he could draw the unenviable assignment of guarding 6-foot-10 Wisconsin forward Ethan Happ, who is third in the Big Ten at 19.3 points per game and second in rebounding at 10.3.